1 of 3 Cut the top fifth off tomatoes and scoop out flesh. Discard or save for another use. 2 of 3 In a microwave-safe bowl, heat wild rice for 2 minutes. Stir in Canadian bacon and cook 1 more minute. Stir in walnuts, mayonnaise, yogurt, parsley, pepper and 1/4 tsp of the salt. Scoop rice mixture evenly into tomatoes; replace the tops. 3 of 3 Toss romaine with oil, vinegar and a pinch of salt. 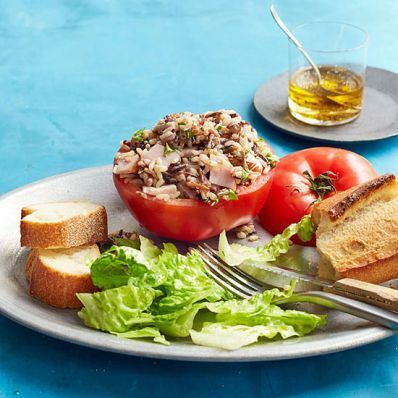 Serve tomatoes alongside salad and bread.